1. A sequined string light sweater to ensure your days are merry and bright. Get it from Amazon for $49.95 (available in sizes S-XXL). 2. A classic crewneck available in tons of different designs, from 3D Rudolphs to one of the most iconic Christmas movie quotes of all time. Get it from Amazon for $14.99+ (available in sizes S-XXL and in nine designs). 3. A cute cardi yule love to layer all season long. Get it from Amazon for $34 (available in sizes 1X-3X). Find it in straight sizes here. 4. A menorah-emblazoned Hanukkah sweater in case you're ready to get lit. Get it from Amazon for $54.99 (available in sizes S-5XL). 5. A 100% cotton sweatshirt that's here to cheer you on and prevent the winter blues. Get it from Good American for $98 (available in sizes 0-6). 6. A Harry Potter-themed option, because Christmases at Hogwarts sounded like the BEST. Just watch out for Nargles in the mistletoe. Get it from Box Lunch for $59.90 (available in sizes XS-2X). 7. 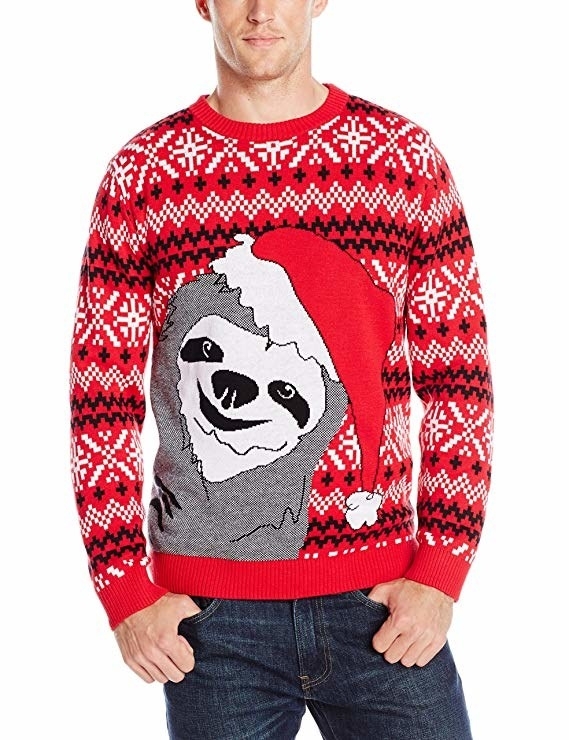 A Santa sloth sweater you shouldn't be slow to scoop up. Get it from Amazon for $21.93+ (available in sizes S-XXL). Find it in women's sizes here. 8. A cheeky sweatshirt that I first saw a few days ago and honestly haven't stopped thinking about since. This pun is haunting me, you guys. Like I want to be mad, but also whoever designed this is a comic genius? Get it from Amazon for $19.90+ (available in sizes S-XXL and in six colors). Find it in men's sizes here. 9. A bright blue number for anyone who stans a Christmas icon, the one and only Mr. Narwhal. 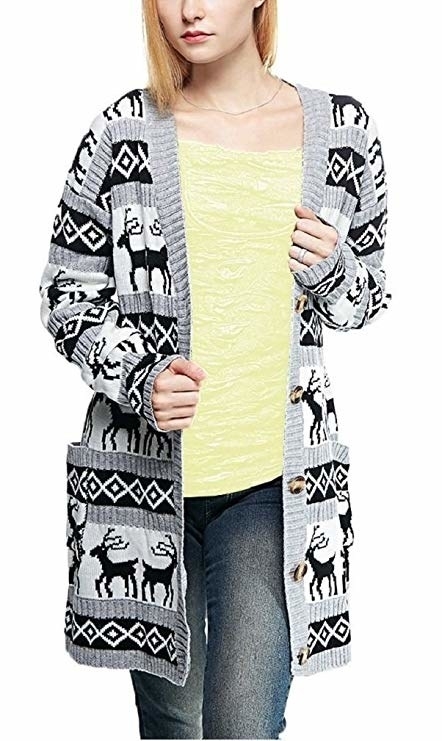 Get it from Amazon for $59.99 (available in sizes XS-XL). Find it in men's sizes here. 10. 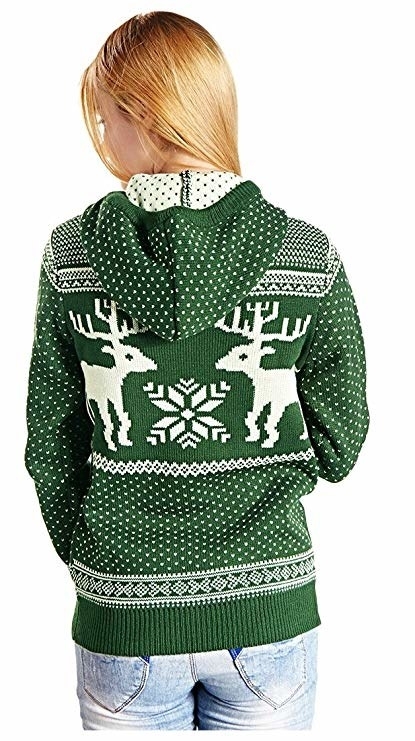 A dotted option with a hood that's not even that ugly tbh, so you could totally rewear it with jeans or leggings throughout the winter. Get it from Amazon for $14.99+ (available in sizes S-XXL and in two colors). 11. A sweet option with 3D embellishments sure to make you say "Rise and shine let's get this gingerbread." Get it from Amazon for $29 (available in sizes XS-XL). 12. A delightful sweater for those of you who plan on spending your holidays with friends (on Netflix, that is). Because why be social when winter is the prime time to binge watch? Get it from Box Lunch for $58.90 (available in sizes XS-2X). 13. A NSFW Fair Isle number featuring some polar bears who are wayyyyy past just breaking the ice. Get it from Amazon for $22.58+ (available in sizes M-XXL). 14. 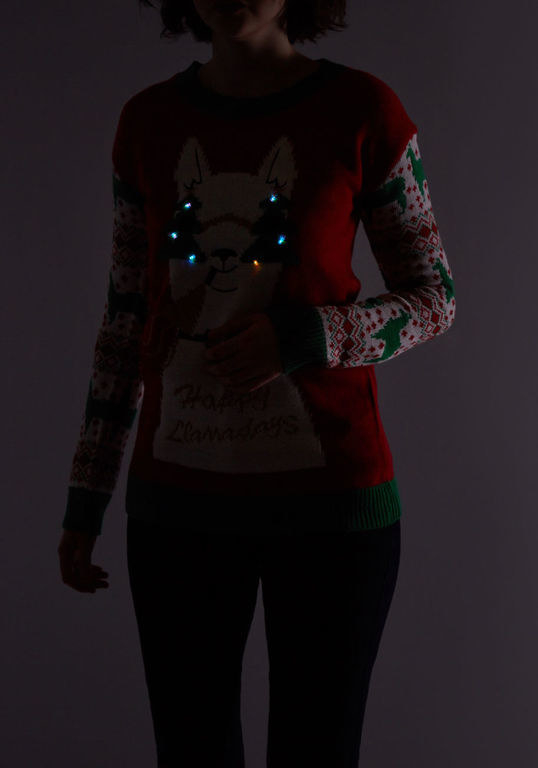 A light-up option for those of us who know that the best way to spread Christmas cheer is not actually by singing loud for all to hear, but rather with LLAMAS. Get it from ModCloth for $49 (available in sizes S-3X). 15. And this adorable sweatshirt, because the same goes for Hanukkah cheer. Get it from Threadrock on Etsy for $19.95 (available in sizes S-XL and in two colors). 16. 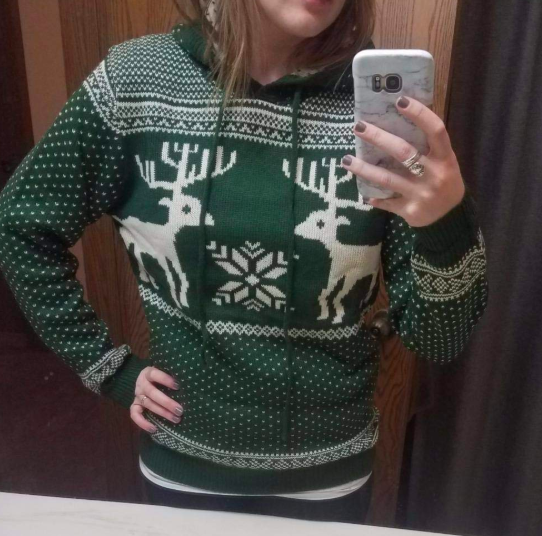 A truly magical sweater that's perfect if you believe in both Santa and unicorns, as you darn well should. Get it from Amazon for $49.95 (available in sizes XS-XXL). 17. A glittery sweater for anyone who has one simple request this Christmas: *extremely Sharpay Evans voice* Fab-yule-us. Get it from Amazon for $19.99+ (available in sizes XS-XXL). 18. A classically tacky option to help you have a ball whenever you wear it. Get it from Amazon for $39.95 (available in sizes XS-XXL). 19. 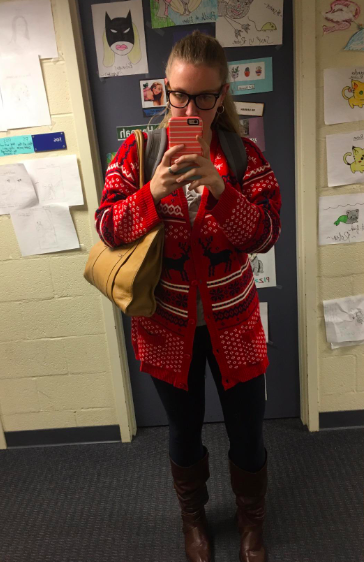 An oversized reindeer cardi that's giving me serious "festive Neville Longbottom" vibes. Plus, it's got pockets for stashing your prezzies! Get it from Amazon for $19.99+ (available in sizes S-XXL and in five designs). 20. A wholesome Hanukkah sweater you're gonna get a latke of compliments on. Get it from Target for $27.99 (available in sizes XS-XXL). 21. A winking Pikachu pullover to make your Christmas the very best, like no Christmas ever was. Get it from ThinkGeek for $29.99 (available in sizes S-3X). 22. 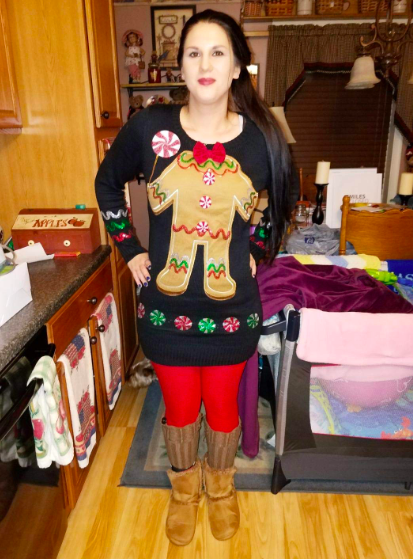 A punny snowman sweater that's a big mood for anyone who has approximately 1,567,302 loved ones to shop for, meals to cook, parties to plan, and people to see this holiday season. 23. A bow-wrapped maternity sweater for anyone who's about to give the world the gift of a whole new person. Get it from Motherhood Maternity for $44.98 (available in sizes S-XL). 24. An LOL-worthy option that makes a compelling argument — there are way too few Hanukkah songs out there, so maybe it's time to reclaim a certain iconic Dead or Alive tune as one. Get it from Amazon for $28.11+ (available in sizes M-XL). 25. 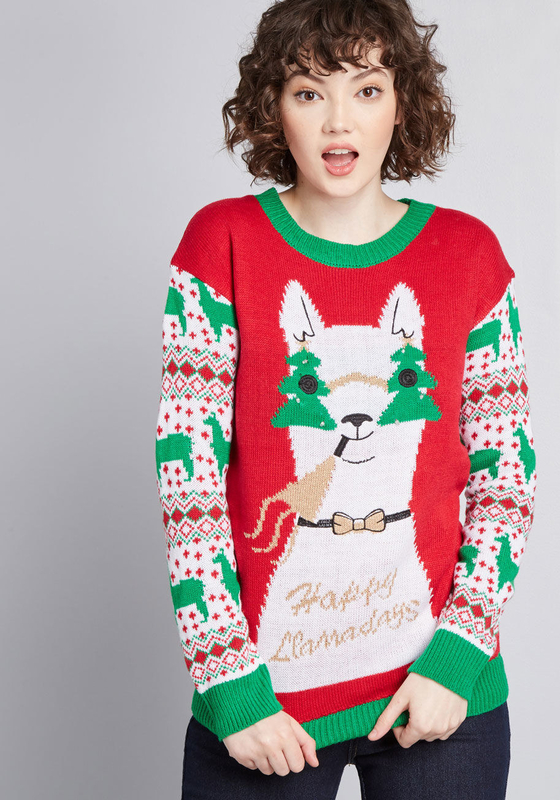 A drool-worthy sweater people will taco bout for Christmases to come. Get it from Target for $39.99 (available in sizes S-2XL). 26. 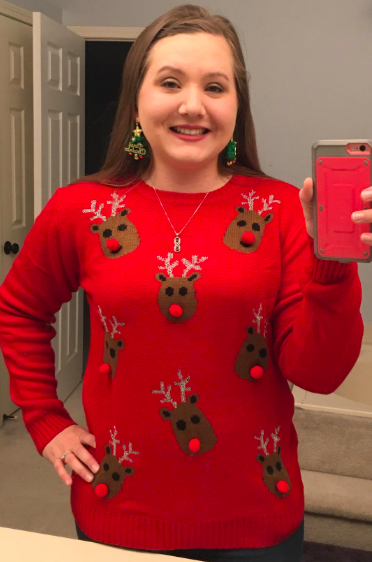 A festive sweater starring some posh penguins and reindeer for anyone who believes cute snow-dwelling animals are the only good thing about cold weather. Get it from Amazon for $12.99+ (available in sizes S-XXL and in nine colors). 27. A sweatshirt depicting a regal corgi, because Santa Paws > Santa Claus. Get it from Shop BuzzFeed on Amazon for $36.99 (available in sizes S-2XL and in three colors). 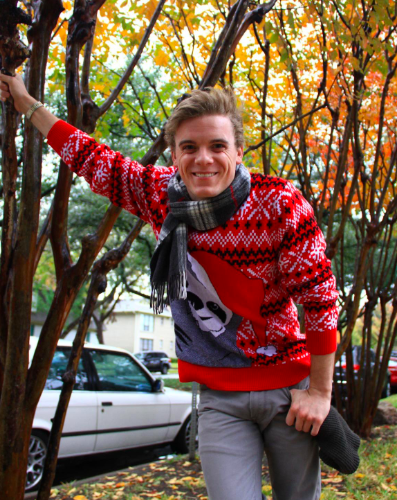 Check out more of BuzzFeed's ugly sweaters here. 28. A bell-adorned kitty sweater that reminds me of that one episode of Hannah Montana where Miley had to wear the meowing sweater her dad got her, only Christmas-ified. Hey, you asked for ugly, so here you go! Get it from Amazon for $39.95 (available in sizes S-L). 29. And this awesome Hanukkah number featuring a pun I wish I knew when I was in Hebrew school. Wow, my Bat Mitzvah speech would have been soooooo much better with this joke. 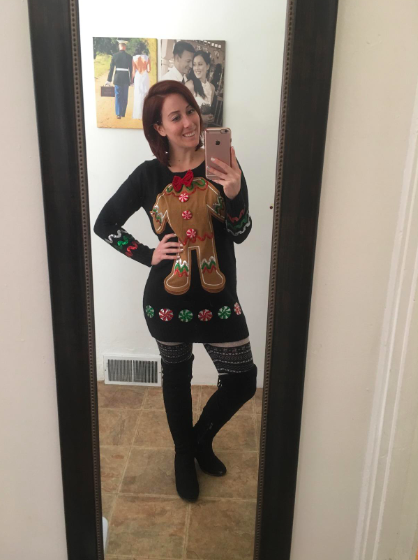 Want more ugly sweaters? 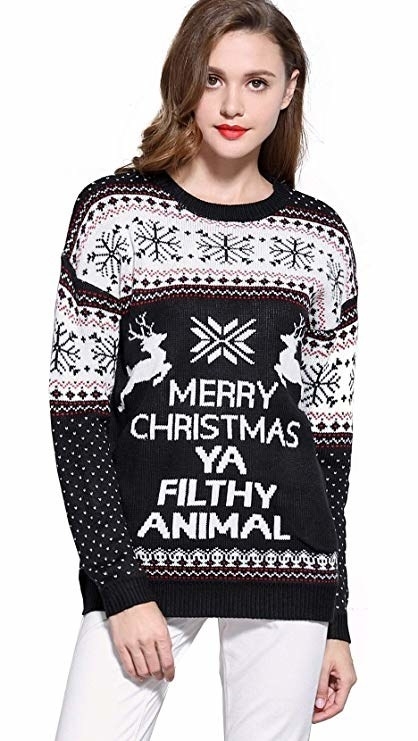 Check out the best ugly Christmas sweaters you can get on Amazon. May your holiday sweater be as amazing and iconic as Mark Darcy's.